Quinn, her older brother Reed, her younger sister Fern, and their neighbor Dylan have always been inseparable. Quinn’s parents run The Hundreds, a summer camp in a cove on the Maine coast, and her summers have always been magical, full of campers, secret wishes hung from the kitchen ceiling, sunrise swims in the Atlantic, blueberries in December, possible sightings of Wessie, the local sea monster, and always, always, Dylan and Reed and Fern, together forever. Until last summer, when something terrible happened, and Dylan died. Now Reed just grunts and stomps around, Fern drips venom with her eyes and her words and sneaks out to do who-knows-what at night, and Quinn is just… stopped. It’s her fault, what happened that night, and everyone knows who the real monster is, and it’s not Wessie. Still, Quinn is trying to fix herself, even if she can’t fix what happened. When she finds the barn doors open one morning on the way to school, she’s lured inside, even though she knows what waits for her there. As soon as she sees the Chris-Craft, she knows what she has to do – she has to restore it. With the help of her Nana, best friend Hana, and new boy in town Alexander, who’s trying to figure out a way around his own sadness, Quinn begins to find a way forward for herself, and maybe even her family – if only she’s brave enough to face the deep blue beyond and all the monsters hidden there. 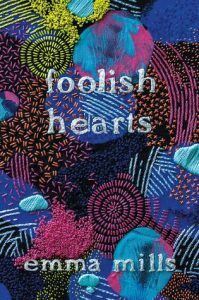 This has been on my teetering TBR pile since last year, but a little nudge from one of our teen volunteers with fabulous book taste moved it into first place for me this week, and ohmygoodness why didn’t I read this sooner?!?!! Also, I’m pretty sure my new retirement plan is moving to Maine and running an oh-so-slightly magical summer camp while hunting for sea monsters in my free time. Everything about this book was as delicious as a ripe blueberry in December. I want to hang out and play board games with Quinn’s family – her parents are fabulous, and I feel like I could get some great knitting tips from her Nana after a serious sanding session. The town of Winship is totally somewhere I’d love to bum around in one summer – all the oddities of a tourist town in winter, and you can just taste the ice cream and lobster right around the corner of spring. And The Hundreds – why, oh why, were none of my summer camp days ever spent in a remote cove with wishes and blueberries and wildflowers and a sea monster?! Also, Greek food. Lots and lots of delicious, homemade Greek food. 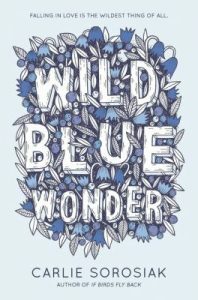 If you love quirky characters, a story rich with friendship, family, and heart, and just a touch of magic, don’t miss Wild Blue Wonder! Addie and her brother Ian used to be two peas in a pod – they always had each other’s backs. 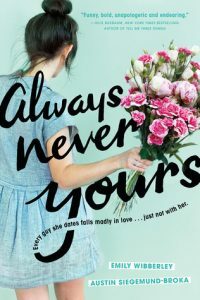 Until the Horrible Thing that happened just a couple of weeks ago with Cubby, Ian’s football teammate and Addie’s secret maybe-boyfriend, leaving Addie broken-hearted and Ian furious and completely unable to stop badgering Addie that she has to tell her parents what happened. But the thing is, Addie can hardly even stand to think about it on her own, much less talk about it with anyone, especially her parents, and Ian just can’t seem to stop nagging. When their latest argument about it ends up with both of them at the bottom of a cliff (well, maybe more of a very steep hill) in Ireland at their aunt’s destination wedding at the Cliffs of Moher, their mom puts her foot down. If they can’t stop fighting for the rest of their vacation, Addie’s out of soccer (in other words, all her scholarship opportunities dashed) and Ian’s off the football team (same). Except Ian doesn’t seem to be too worried about football, which is weird, because Ian is the star player on the team – his whole world is football… right? And then Addie catches Ian sneaking out of the hotel and getting into a very derelict and extremely sketchy car with a super-cute Irish boy Addie’s never heard of. There’s no way Addie is letting anything crazy happen – not with soccer on the line – so she goes with them, in spite of Ian’s very loud protests. What happens next is a whirlwind road tour of Ireland (and more than a few not-so-lucky-mechanical setbacks), the Irish music scene, and Addie and Ian’s dreams about the future – which, it turns out, aren’t quite what either of them thought. 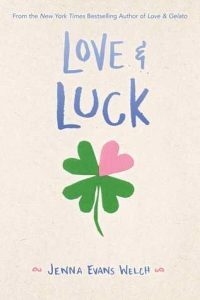 If you read Jenna Evans Welch’s first NYT bestseller Love & Gelato, you’ll be happy to know that Addie’s BFF Lina and her super swoon-worthy Italian boyfriend Ren drop in for a cameo in Love & Luck too! Light, sweet, fun, full of music, friendship, family drama and love, and a whole lot of Irish green, this book is just the sunshine I needed after a looooong winter. And, if you’re working on the April Reading Challenge, there’s a square or two this’ll help you mark off too!